As you know, lately I’ve been fascinated with recycled art, or the process of one artist adding their own vision to already existing, usually cheery and innocuous works, especially those that are sold for pennies at thrift stores. And it looks like a lot of you guys are too. So if you enjoyed last week’s mash-up works by Chris McMahon and Thyrza Segal, then you’ll dig what artist Jeff Bennett has done with the ubiquitous work of artist Thomas Kincade. But in a series called, “War On Kincade,” Bennett places Kincade’s bucolic settings right in the middle of an aggressive occupation by the Galactic Empire of Star Wars. Bennett seamlessly introduced the stormtroopers, creatures and machines of The Empire into the scenes, and it’s amazing how seamlessly some of them fit. Still, it doesn’t look like the Force is with the cutesy villages and cottages of Thomas Kincade, and while Darth Vader is nowhere in sight, where’s Luke Skywalker when you really need him? This entry was posted in Art, Humor and tagged Art, Artists. Bookmark the permalink. 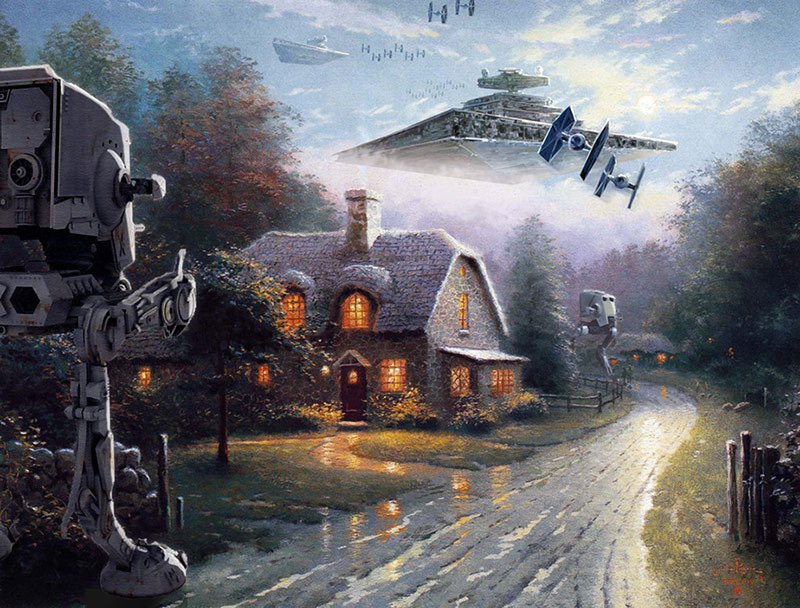 I was never a fan of Kinkade, it just wasn’t my style but I like these galactic invasion paintings…they’re fun. Hey Kongo … the intergalactic version are a lot more interesting, that’s for sure! The result looks a little eerie, but in a good way. I can see stories in these pictures. Hi Colline … I know. And those stories seem a lot more interesting. hehe … hey there SSY. I know … I owe Mr. Kincade a big apology. Hmmmm … Middle Earth New Zealand … that’s an apt correlation. Maybe the next round should feature characters from the Lord Of The Rings! LOVE IT! The dark side of the force is strong in these paintings (mashups). Now all we need is a litany of ewoks lying around (or is it smurfs?). hey chris … pretty trippy stuff, eh? yah! where are the ewoks? Hey there, Paula … indeed. where do people come up with this stuff? HAHA!!! I wish I could like this a million times! Thomas Kincade’s detestable works of “art” needed this! hehe … hey there, impybat! it seems like a lot of people are of the same opinion. i’m thinking Bennett took great glee in setting that cottage on fire.